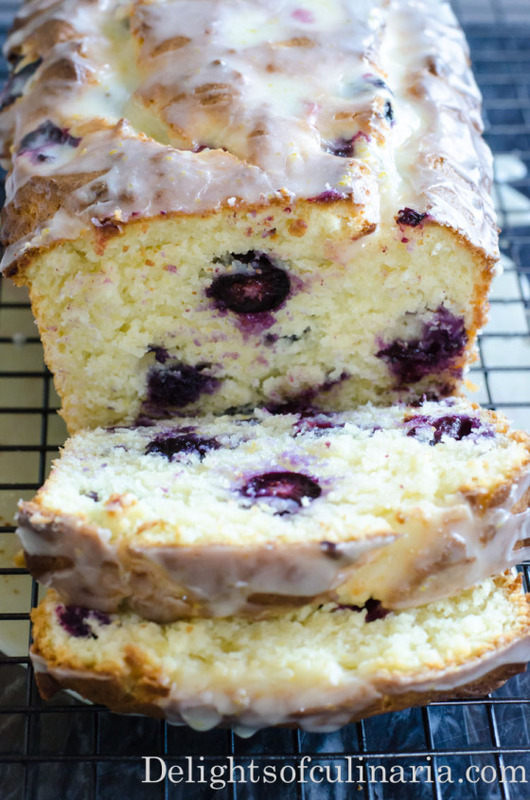 This Lemon blueberry bread is bursting with deliciousness! 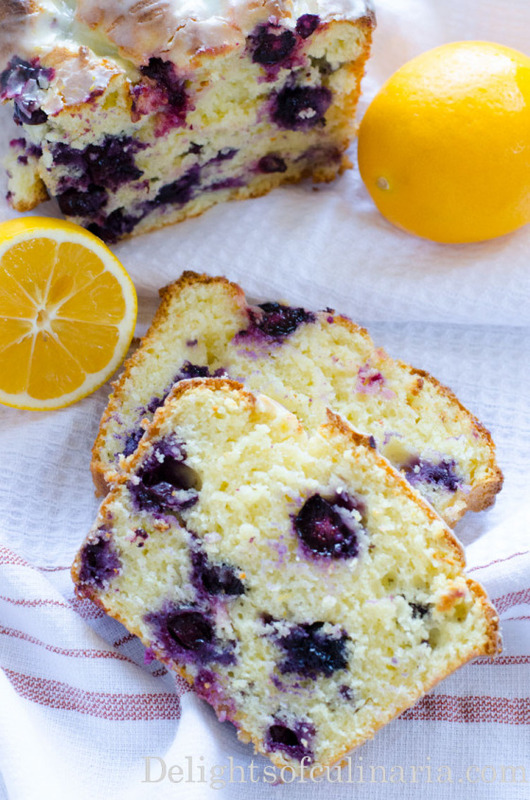 Sweet juicy blueberries and tangy lemon complement each other well. Lemon glaze on top of the bread makes it divine and scrumptious. It’s a perfect breakfast bread with coffee or tea. Spray 8×4 loaf pan with cooking spray. In small bowl, toss blueberries with 1 tablespoon flour. In a large bowl, whisk together flour, baking powder, and salt. Set aside. In a separate bowl, mix together the butter, vanilla, eggs, sugar, sour cream,milk, lemon zest, and lemon juice. Combine the wet and dry ingredients, just until smooth. Do not overmix or your bread will come out tough. Gently fold the blueberries into the batter. Pour batter into prepared loaf pan and bake for 50-55 minutes. The bread will be finished when a toothpick inserted into the center comes out clean. Once bread is finished, remove from oven and allow to cool for about 10 minutes in the loaf pan. Remove from loaf pan and transfer to a wire rack to cool completely. Once bread has cooled, whisk together the powdered sugar, lemon juice and zest. Start with one tablespoon of lemon juice and whisk well. If your mixture is too thick, slowly add up to one more tablespoon of lemon juice. You want the glaze to be thin enough to drizzle, but thick enough to set up on the bread. Using a spoon, drizzle the glaze on top of the bread. The glaze should harden up a little more after about 15-20 minutes. Spray 8x4 loaf pan with cooking spray. Will definitely try this. Thank you. P.s. What is and how do you prepare lemon zest?! It seems easy enough but I’ve never used zest before. Thank you. Here is a how to link…http://www.instructables.com/id/how-to-zest-a-lemon/. I apologize :(. I corrected. 2 eggs. Looks delicious !! Planing on makeing it tonight .. One question though, can I use frozen blueberries ? Thank you, I wouldn’t use frozen. It will make it soggy. Do frozen blueberries work for this recipe ? I haven’t tried with frozen, but I think it will make it soggy. Hi Karolina, I didn’t try with pastry flour, Im guessing it should work.But not sure. Should the butter be melted? To those who asked about using frozen blueberries, I made this bread twice and I used frozen because that is all I had on hand. The loaf turned out perfect, it was not soggy at all. It was a hit, everyone loved it. Thanks! Thank you Diana! great to know that it works well. Appreciate it.